Please post all your comments, questions and info regarding the Rolling Stones No Filter Tour 2017 in Dusseldorf Germany here. Edited 1 time(s). Last edit at 2017-05-28 14:50 by bv. Love this venue. Great show in 2007. Any info about ticket prices? Also General Admission or seated (like 2007)? Edited 2 time(s). Last edit at 2017-10-06 15:15 by Irix. Any info about ticket prices? There's a Pre-Presale exclusively via [www.Bild.de] Newspaper: 12-May-2017, 8:00am-12:00pm CEST. Edited 1 time(s). Last edit at 2017-05-09 22:35 by Irix. In 2014 the BILD persale was via Ticketmaster. Anyone know if this is the case again? Or eventim? 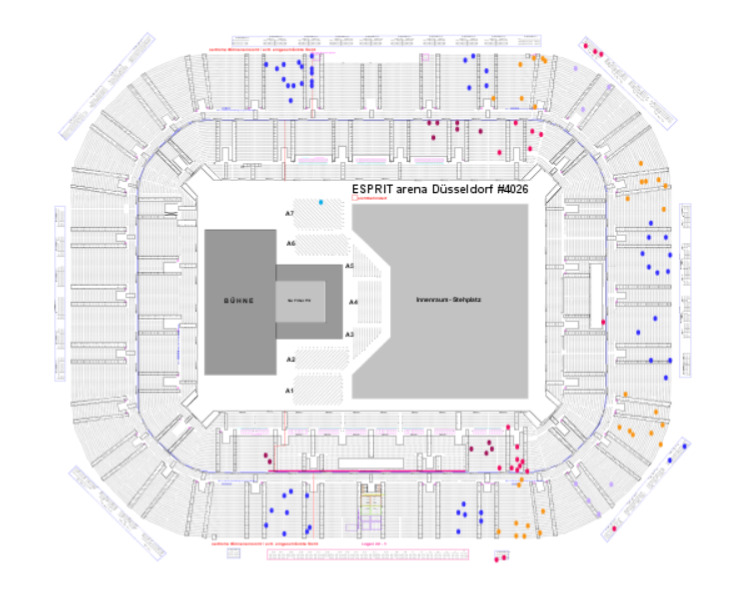 In 2014 the BILD presale was via Ticketmaster. Anyone know if this is the case again? Dunno - could also be myticket.de because it's (since the end of 2014) a subsidiary of Deutsche Entertainment AG (DEAG), the german Stones-Tour-Promoter. Edited 1 time(s). Last edit at 2017-05-10 12:30 by Irix. Edited 1 time(s). Last edit at 2017-05-10 01:45 by MAF. Are the presale times local time? it looks like the BILD sale is EST: eastern? In 2014 the link appeared some days after the shows were sold out. So then - what is 60€? Anynone knows if the eventim presale is limited to 2 tickets as well? I need three seated. Who's selling the tickets exept the pre-pre-sale with tabloid "Blöd"? I guess eventim since they do the presale from 12h on. I was there in 2007 and 2014. I hope that I can get a ticket this year as well. Does anybody know how the presale via the Rolling Stone App is working? Do I need a creditcard? Don´t want to sign in via "Bild". The App pre-sale begins as well as that one via Bild-Zeitung. The App pre-sale begins as well as that one via Bild-Zeitung. The exclusive BILD-Pre-Presale runs on 12-May-2017 from 8:00am to 12:00 noon -- [www.Bild.de] . The RS-App Pre-Sale runs from 12-May-2017, 12:00 noon to 13-May-2017, 10:00am -- [www.RollingStones.com] . Anynone knows if the eventim presale is limited to 2 tickets as well? It's limited to 8 Tickets per order in the Eventim-Presale: [www.Eventim.de] . No. I don't think so. I guess it is pretty much like in 2014. 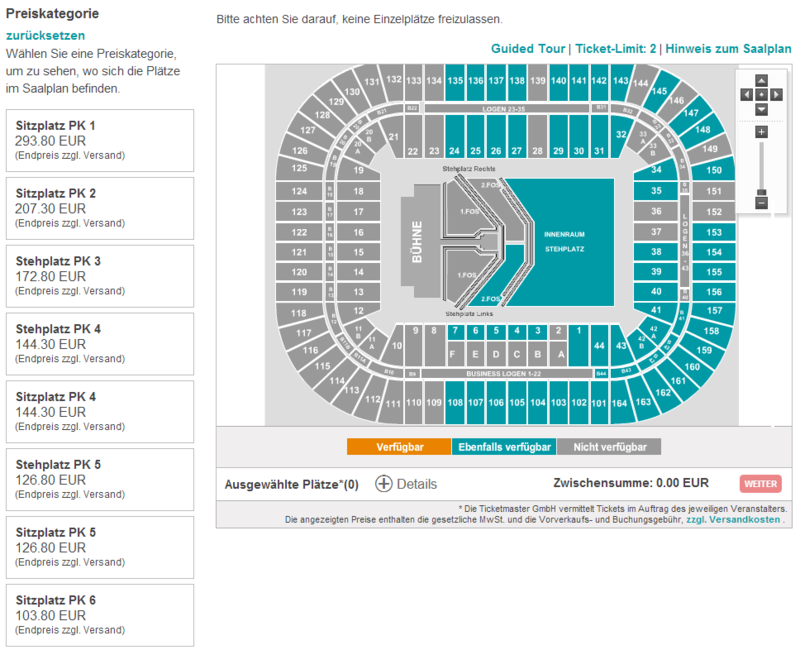 There will be seats on the field as you can see at ticketmaster.de offering Platin Tickets. Or first FOS-seats and then standing tix.